© and ® 2011 Vista Higher Learning, Inc.6B.1-1 Punto di partenza Youve learned how to use the passato prossimo to express past actions. Now youll learn. 1 © and ® 2011 Vista Higher Learning, Inc.6B.1-1 Punto di partenza Youve learned how to use the passato prossimo to express past actions. 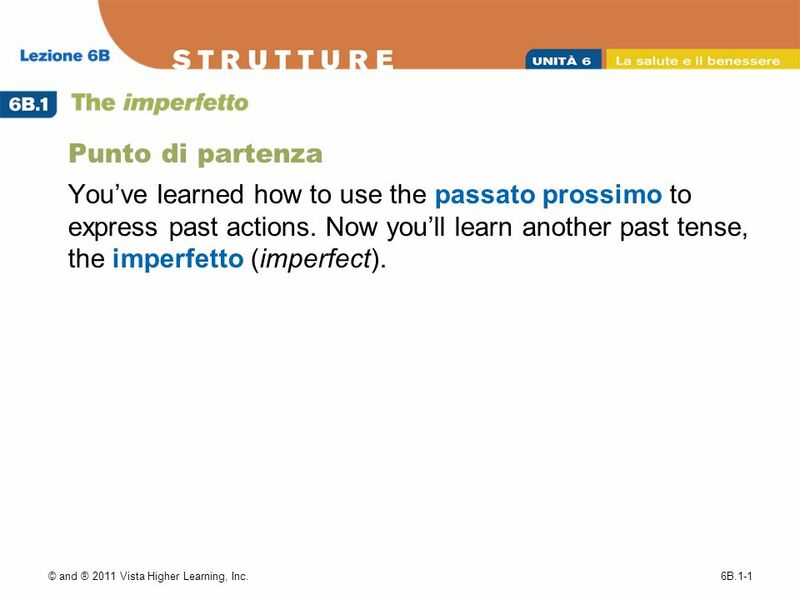 Now youll learn another past tense, the imperfetto (imperfect). 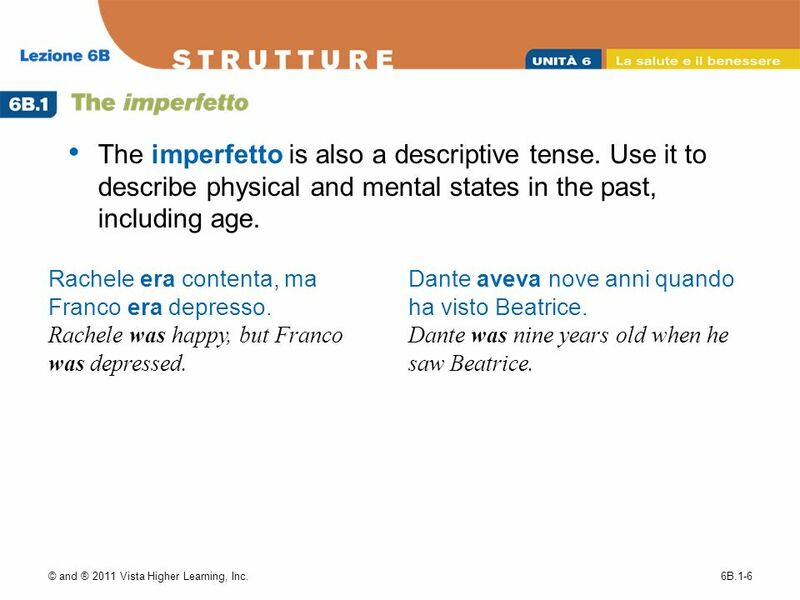 2 © and ® 2011 Vista Higher Learning, Inc.6B.1-2 The imperfetto can be translated into English in several ways. Lia piangeva. Lia cried. Lia used to cry. Lia was crying. Facevo esercizio. I exercised. I used to exercise. I was exercising. 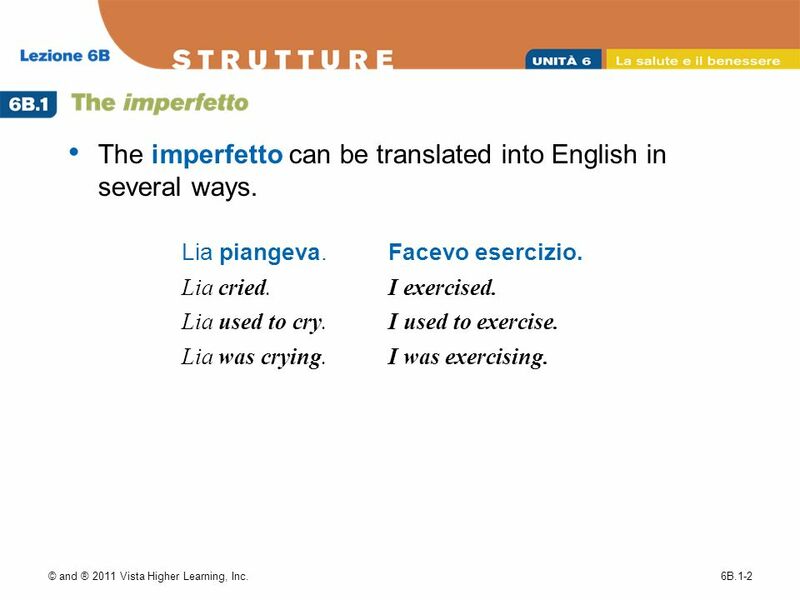 3 © and ® 2011 Vista Higher Learning, Inc.6B.1-3 The imperfetto is a simple tense; it does not require an auxiliary verb. The pattern of conjugation is identical for verbs ending in -are, -ere, and -ire. Drop the -re to form the stem and add the imperfect endings. 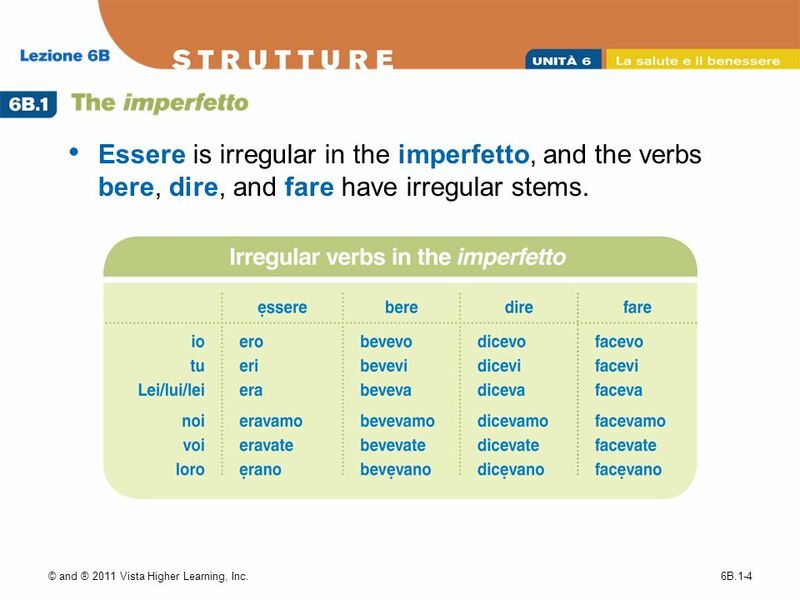 4 © and ® 2011 Vista Higher Learning, Inc.6B.1-4 Essere is irregular in the imperfetto, and the verbs bere, dire, and fare have irregular stems. 5 © and ® 2011 Vista Higher Learning, Inc.6B.1-5 Alberto faceva esercizio ogni giorno. Alberto used to exercise every day. Andavo regolarmente dal dottore. I would go to the doctor regularly. 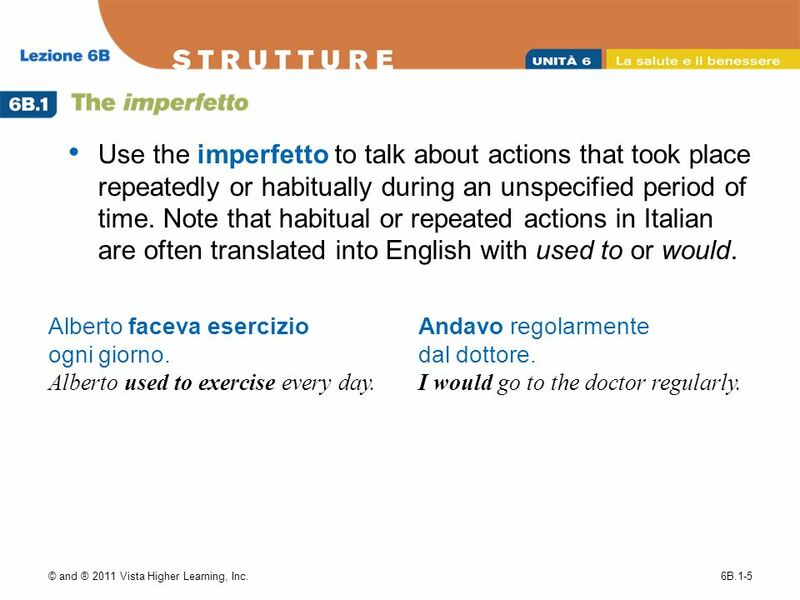 Use the imperfetto to talk about actions that took place repeatedly or habitually during an unspecified period of time. Note that habitual or repeated actions in Italian are often translated into English with used to or would. 6 © and ® 2011 Vista Higher Learning, Inc.6B.1-6 Rachele era contenta, ma Franco era depresso. Rachele was happy, but Franco was depressed. Dante aveva nove anni quando ha visto Beatrice. Dante was nine years old when he saw Beatrice. 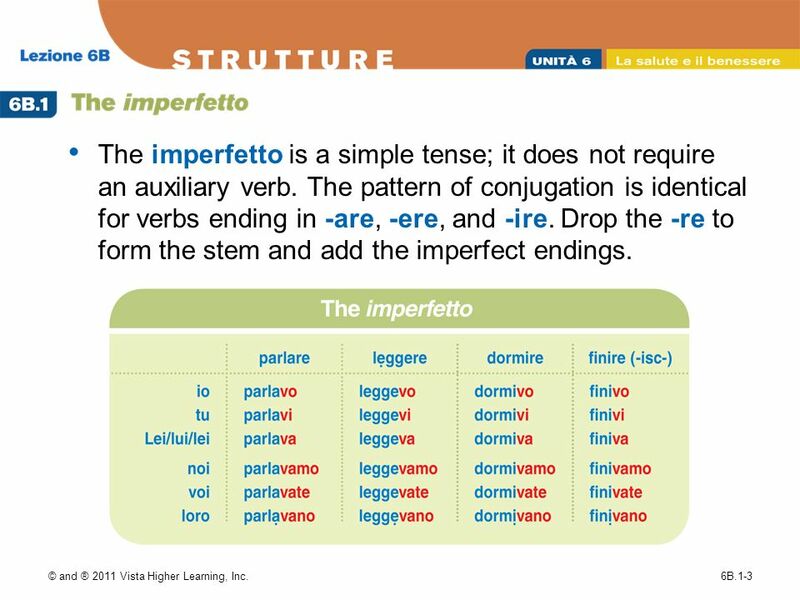 The imperfetto is also a descriptive tense. Use it to describe physical and mental states in the past, including age. 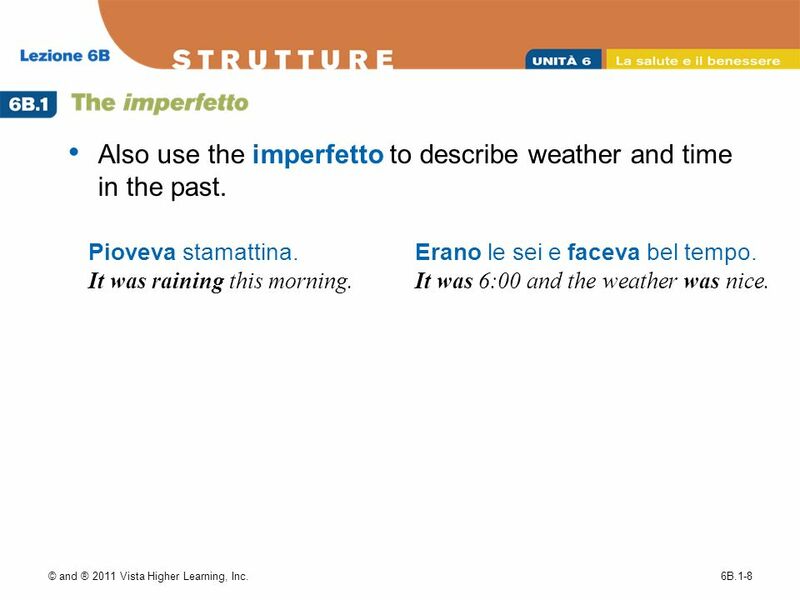 8 © and ® 2011 Vista Higher Learning, Inc.6B.1-8 Also use the imperfetto to describe weather and time in the past. Pioveva stamattina. It was raining this morning. Erano le sei e faceva bel tempo. It was 6:00 and the weather was nice. 9 © and ® 2011 Vista Higher Learning, Inc.6B.1-9 Use the imperfetto to describe an action or actions in progress in the past. Mentre (While) often signals two ongoing actions occurring over the same period of time. Linfermiere parlava mentre leggevo la ricetta. The nurse was speaking while I was reading the prescription. Carlo piangeva mentre guardava quel film. Carlo was crying while he was watching that film. 10 © and ® 2011 Vista Higher Learning, Inc.6B.1-10 An ongoing action in the imperfetto can also be interrupted by another action expressed with the passato prossimo. 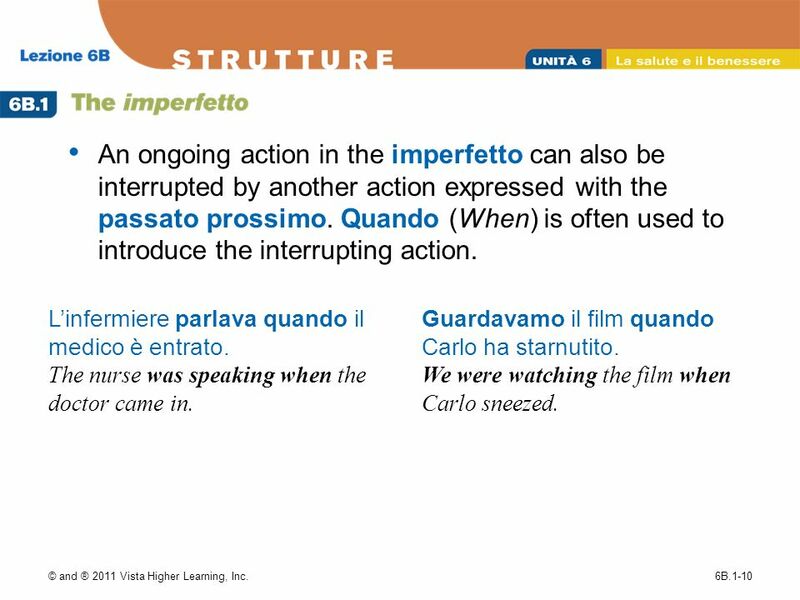 Quando (When) is often used to introduce the interrupting action. Linfermiere parlava quando il medico è entrato. The nurse was speaking when the doctor came in. Guardavamo il film quando Carlo ha starnutito. We were watching the film when Carlo sneezed. 11 © and ® 2011 Vista Higher Learning, Inc.6B.1-11 1. Da piccola, Geltrude non (amavo / amava) leggere. 2. A te (piaceva / piacevano) i broccoli da bambino? 3. Le nostre camere da letto (erano / eravate) molto piccole. 4. Io non (beveva / bevevo) il latte. 5. Chi (voleva / volevo) diventare un dottore da bambino? 6. Voi (preparavi / preparavate) dei dolci buonissimi. 7. Io e Antonio non (dicevate / dicevamo) mai bugie (lies). 8. Quellinverno (facevo / faceva) veramente molto freddo. Scegli la forma corretta dellimperfetto per completare ogni frase. Download ppt "© and ® 2011 Vista Higher Learning, Inc.6B.1-1 Punto di partenza Youve learned how to use the passato prossimo to express past actions. Now youll learn." Limperfetto The Imperfect Past Tense. When we use limperfetto was/were doing was/were doing Used to do Used to do Time in past tense Time in past tense. © and ® 2011 Vista Higher Learning, Inc.6B.2-1 Punto di partenza Although the passato prossimo and the imperfetto are both past tenses, they have distinct. Punto di partenza Partitives express some or any; they refer to part of a whole or an undefined quantity. To form the partitive in Italian, combine the. The conditional tense in Spanish expresses what you would do or what would happen under certain circumstances. Copyright © 2008 Vista Higher Learning. V Except for IRREGULAR verbs, you will find this characteristic consonant in all imperfect verb endings! © and ® 2011 Vista Higher Learning, Inc.4A.1-1 Punto di partenza The verbs dovere (to have to/must; to owe), potere (to be able to/can), and volere (to. Punto di partenza Adverbs describe how, when, and where actions take place. They modify verbs, adjectives, and other adverbs. Unlike adjectives, adverbs. Punto di partenza Adjectives are words that describe people, places, and things. In Italian, adjectives are often used with the verb essere to point out. © and ® 2011 Vista Higher Learning, Inc.11A.2-1 Punto di partenza With the exception of the imperative and the conditional, the Italian verb forms you. © and ® 2011 Vista Higher Learning, Inc.7B.2-1 Punto di partenza In Strutture 7B.1 you learned the informal imperative. Use the formal imperative to give. 3.2 © and ® 2011 Vista Higher Learning, Inc The imperfetto Use the imperfetto to talk about what used to happen or to describe ongoing and habitual. © and ® 2011 Vista Higher Learning, Inc.1B.3-1 Punto di partenza Use the verb essere with numbers to tell time. © and ® 2011 Vista Higher Learning, Inc.6A.3-1 Punto di partenza Use the adverb ci to mean there or to replace certain prepositional phrases. Use the pronoun. Preterite vs. Imperfect Two tenses that refer to the past.